There seems to be a growing desire for generalists, again. The pendulum swings between the want for specialists and generalists every few decades. I wonder if it coincides with the lifetimes of the preceding generations of people, going in and out of the workplace. Meaning, let’s say something in particular needs to be developed or achieved in a society, as a whole. So, companies go out and hire bunches of men and women who know how to a particular thing and who can do it well. Then, after that series of problems is solved, the need for specializations isn’t as big anymore. Instead, what’s hotly desired is people who can see the big picture, who can bring together opposites, who can extrapolate, and who can interconnect things, people, and resources that seem completely unrelated. Enter, the Generalists. In some ways, we’re an odd bunch. We may not always be able to go deep into every topic, but we sure do like seeing how others’ years of expertise and experience can be used to help people in need. Generalists and specialists. Each have a place, and each have a purpose. Which one are you? What are your unique desires and interests that can be crafted into benefiting the world? Do you love the details or the broad view? Both are needed, yet each of us tend to better relate to one or the other. In quilt making, specialists find a color or pattern they like and use the same one over and over. A generalist is a ragpicker who can take even the most disparaging bits and pieces of cloth and sew them into a quilt, equal in beauty to that of their specialist counterparts. Elmer Gates, Nathan Myhrvold, Lowell Wood, and Donald Sutherland. Three inventors and an actor. Each were/are idea men. Each were/are generalists, in their own way. Gates would sit in a dimly lit room for hours, picking up on bits and pieces of ideas that would flash in his mind, creating a new invention before his very eyes. Equally adept at connecting differing pieces into a cogent whole, Myhrvold and Wood have gone on to invent all sorts of things. Yet, they would both tell you that they see themselves at generalists and not as specialty-minded folks. Sutherland, with his 150+ films, picked his roles and acting parts not based on trying to progress up a career ladder, but based on what the character’s lines spoke to him. As a result, he wound up playing all sorts characters and roles. And, he loved every bit of it. There’s an American living in Ecuador whose blog I’ve followed off and on, over the years. I’ve followed Dom Buonamici’s work, in part, because he changes out his occupation title at the end of his emails, from time to time. Sometimes he’s a “business investor”, sometimes a “real estate developer”, sometimes a “beachside hut dweller”, and other times a “international traveler”. Each self-proclaimed title speaks to the interest that he has or is developing at the time. I always look forward to how he’s going to sign off his next message or post. People talk about starting over, rebranding themselves, or figuring out a different way to do things. Each of those comes with a willingness and a desire to make a change. It seems like it would be easier for generalists to change than specialists, because they can see how everything is connected to everything else. And, they probably get bored a whole faster than other people do. Being a generalist, I’m excited that the world seems to be interested, again, in what “my kind” has to offer. For so many years, it seemed like you had to have a specific degree from a particular type of school, or nobody in the hiring realm was going to give you a chance to prove what you had to offer. But, “times are a’changin’,” as my Dad says. Still, not to worry if you’re specialist in something. You’re in vogue…for now. Just kidding! You’ll always be needed, as well. It’s just fascinating how interest in a particular type of mindset, ability, or perspective comes and goes over the years. The world beyond this hallowed ground. That through the days, we feel their plight. And wishes us release their lives. To fill the holes, your heart does keep. You will see how much He’s met. A few months ago, I learned that a mental process of mine had a long Greek name associated with it. I set out to discover what this mental process was, who else had it, how it helped or hindered us, and how best to take advantage of what I have come to call the “Gift of Synesthesia”. Earlier this year while walking into work, a field of rye grass and the leaves on a row of eucalyptus trees were going back and forth in rhythm with the blowing wind. I stopped and stared because I realized that the rye heads and eucalyptus leaves weren’t just moving – I sensed vibrations coming off of them (stronger than normal), perceived lines and waves in my mind, and heard the whole as a symphony in my mind. It was profound. At first, I thought I was imagining things and then realized I had joined their symphony by the simplicity of my standing there. I was swept along in the movements, riding the waves of motion. Later that day, I checked again – yep, same sensations. Then, I started thinking about how I used to see and sense similar things when I was a kid, a teenager, in my 20s, 30s, etc. I realized it was the same. In trying to figure this thing out, I researched “sensing vibrations from things you see”. Came across some articles, which led me to others, which led me to “synesthesia”, which led me to youtube, which led me to an interview with some synesthetes. One of them closely expressed what I was feeling. I was so excited that I started crying. Finally, this thing wasn’t weird! It had a name! 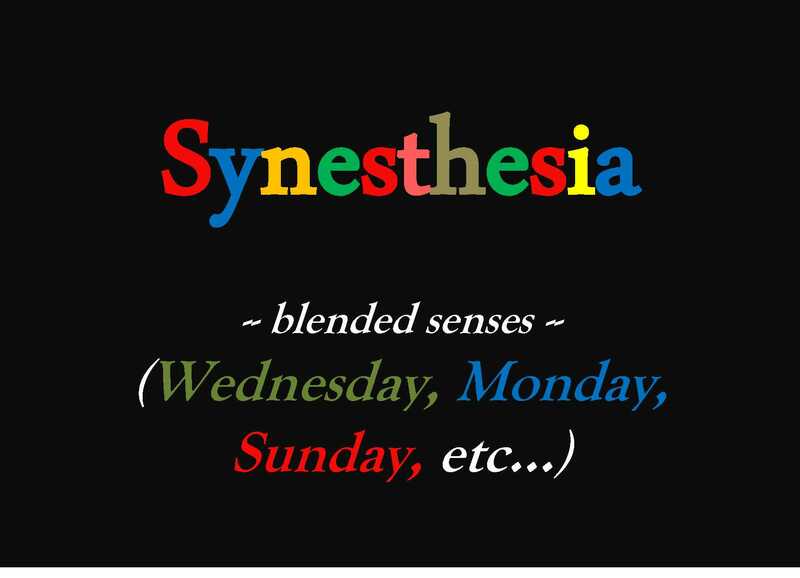 Synesthesia is basically a blending of the senses. Some people perceive colored numbers, taste colors, see the entire number line, or see a calendar that rotates in their minds. For a more complete definition with links and references, check out: wikipedia.org/wiki/Synesthesia. Okay. Now what? How do I best use this for the next 50 years? I’ve been asking around, learning more, and looking into some possibilities. From what I understand at this point, my synesthesia manifests itself in multiple modalities. There are lots of different reactions in my head to the various inputs. Each sense evokes a unique response at times, while some senses constantly blend together multiple things. Wednesdays are muted-green; Mondays are blue; etc. Recently, when I was looking through a collection of pictures from a friend, I saw a pink flamingo and “Tuesday!” came to mind. I know – it might sound weird – but there you have it. I believe that’s where part of my intense creativity comes from. I haven’t always known what to do with the artistic words, images, paintings, pictures, poetry, music, and lyrics that have appeared in and flooded my mind over the past four decades. I’ve expressed some through books, songs, and teaching. But I’ve filed away many others in my brain, waiting for the right time. Maybe that time has finally come. Another example that comes to mind is a car I bought from a friend who was moving out of town. Carnell smoked a lot and used a particular gel air freshener to cover the smokiness in the red Lincoln. Every time I got in that car, I told him that it smelled “purple”. We laughed about it. But he finally understood what I meant when I discovered that one of his air freshener gel cans had slipped down inside behind the glove box next to the heater core. So, that thing was just pumping out a deep cherry-purple smell every day! I finally got rid of the odor in the car, but every time I smell it in the aisle in a store or in an office somewhere, it immediately takes me back to Carnell’s red Lincoln…purple. Also, if I tilt my head a certain way while looking at the computer screen, some of the letters turn green or purple. Other words pick up a reddish or yellowish hue around them. Now, that might just be the lighting of the screen, but either way it’s pretty darn cool. I tell myself that the letters are all just plain black, and they won’t distract me. Sounds are especially a hot topic for me – always have been. So, I’ve carried earplugs with me for the past 20 years. At parties and sports events, I wear them to take the edge off, yet can still hear conversations just fine. After a couple of years of mentioning it or asking people about it when was young, they implied that I was making things up, that I was nuts, or was just being weird. So, I kept it to myself. But, it’s still been there every day – just didn’t know what it was. Now I do. Since realizing what “this” is, I’ve decided to let it run. It’s been a very fun couple of months! I feel like I’m finally me, again. If you think you may have synesthesia or know someone else who does, I would love to hear about your/their experiences. You can also find out more by answering some questions at www.synesthete.org . The site is run by a research lab at Baylor University in Houston, TX. Thanks for stopping by, today. I hope you liked the post! Aviazje could feel motion, not just see it, but feel it. Whenever the trees moved around him, he would stand and sway with them, feeling the wind blow through, taking him along for the ride. These were special moments when he could stand alone in the woods and let the trees and wind do their thing. To Aviazje, the fields around his house weren’t just fields, they were a symphony. When the wind blew the rye grass or the wheat, he watched as the orchestra of blades and stalks play their opus, rounding out the set with crescendos and then softer, softer. He thought the whole world saw what he saw, felt what he felt, and sensed what he sensed. But apparently, they didn’t. His friends at school laughed and made fun of him when he swayed to the music in class, or bounced in tune to the happy beats he heard in his head – sometimes they came from the records or tapes that the teacher played, and sometimes they came from all of the recordings he had stored in his mind. He couldn’t control his automatic reactions to the music or to the sights. But, after his classmates laughed at him over and over, he learned ways to ignore the impulses to move with the music and to block out the motions he saw and felt. When he was in public, he would walk around with his hands in his pockets and his head down, trying not to sense anything around him. But it didn’t work for long. Looking down, he started seeing patterns in the sidewalk cracks, and motion flowed through his body from that. Not understanding what was going on, he eventually wished he would go blind, deaf, or numb. Maybe being dead would solve his problem, he thought to himself on occasion. But then, he would look out across the fields, run into the woods, and let himself be swept up in the glory that surrounded him from every side. When storms came and thunder rolled, he could feel the heartbeat of heaven. When it rained, he could feel the tears of blessing fall upon the ground. Then, as he walked across his yard, he would sense the earth’s heart beating along with his – a different rhythm, distinctly its own – but a heartbeat, coming from below his feet. And what a pounding it gave off. What a thunderous roar it would lurch forward with and remind him it was good to be alive – to feel the motions he saw. After that day, whether he was inside his house or at school in class, he would simply touch the walls, the floor, or his desk and feel the vibrations tell him of the song that had been sung throughout time. Then, he would lay in the yard looking up toward the sky with palms stretched downward, and touch the ground. He let the orchestra of grass, dirt, and air play their melodies and pulsate their rhythms through his little body. In moments like that he was in tune with his core. No one could ever take that away. This week at work, a couple of friends and I were talking about some of the different websites that are out there now that help you learn other languages. And why doesn’t one just crush the other? And gives wait ’til it lays its head down for sleep. Of the viewers and occupants there below. Excerpted from one of Reep’s upcoming books.